Every Native American tribe had a Shaman, or Medicine Man, found within the their hierarchy serving as healers, seers and purveyors of most rituals and ceremonies that were performed. Those ceremonies ranged from weddings, burials, beseeching the spirits for good hunting, a good harvest, protecting the warriors when on war parties or in some cases when they actually went to war. 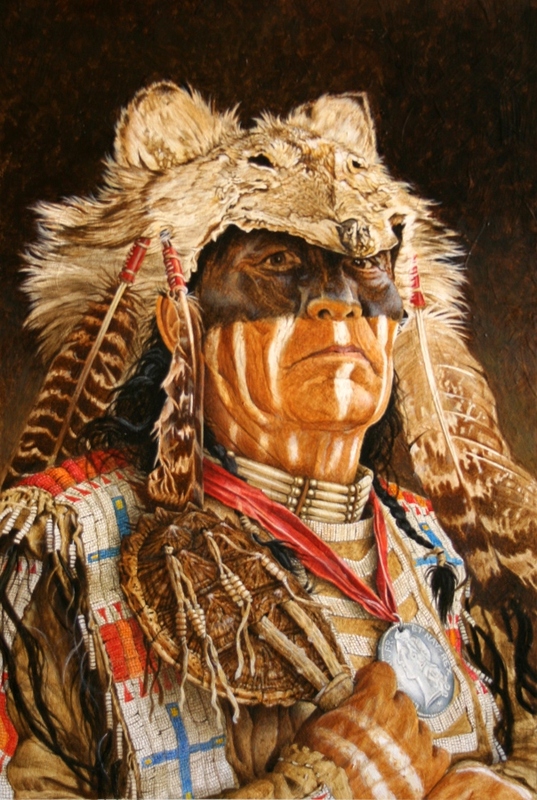 The indian in my painting “The Shaman”, is a Cherokee Medicine Man, wearing a distinctive coyote skin head piece while holding a “Turtle Shell Rattle” used, for among other things, to awaken the spirits during various ceremonies. His face is half painted black in an attempt to conjure good fortune or possibly to bring safe return and or victory to warriors leaving camp on a war party. Blackened faces were commonplace among indian warriors, especially when returning to camp after war parties they would sometimes stop and paint their faces black to indicate that they were victorious in their endeavors.